It's summer, 1941 and there is nothing 12 year old Karl Friedmann enjoys more than being part of the Deutsches Jungvolk, anticipating the day he'll be old enough to join the Hitler Youth. But on the day he wins a badge for achievement during some war games, he is also forced to fight another boy, Johann Weber, whose has just received word that his father was killed in the war. Suddenly, fighting feels more like bullying. At home, Karl knows his older brother Stefan is the family rebel, always getting into trouble and was even sent away to a boot camp for a week, where the Gestapo had beaten him and shaved his head. When Karl notices an embroidered flower sewn into Stefan's jacket, he wants to know what it means. But before that happens, the Friedmann's receive a telegram that their father has been killed flying for the Luftwaffe. Their mother falls into a terrible depression, not speaking and refusing to get out of bed, so it is decided that the family would go stay with their grandparents in a village near Cologne. Once there, Karl is kept out of school to prevent him from participating in Jungvolk activities and it doesn't take Stefan long to hook up with some friends who are also rebellious troublemakers. One day, Karl decides to go out for a ride on his bike, but he has an accident, colliding with the beloved car of Gestapo Commander Gerhard Wolff. Luckily, Karl is wearing Jungvolk uniform, but Wolff still seems suspicious of the Friedmann family, anyway. Karl also makes friends with Lisa, a girl who isn't afraid to let her hatred of Hitler and his whole Nazi regime be known. And when he notices that the embroidered flower has been cut out of Stefan's jacket, he is more curious than ever about his brother's activities and friends, suspecting anti-Nazi undertakings. Slowly, Nazi brutality forces Karl to rethink his own beliefs and patriotism. He learns that Lisa's father was taken away one night because of his beliefs and she has no idea where he is or if he is alive. Instead of feeling proud that his father sacrificed his life for the Fatherland like he is supposed to, Karl feels grief and sadness, and wonders what was it all for. Karl's suspicions that Stefan is involved with a resistance group are conformed when his brother's finally confesses to him that he is a member of the Edelweiss Pirates, a loosely bound group of anti-Nazi young people who are trying to enlighten the German people to the truth of Hitler and his ideas. Unfortunately, Commander Wolff also suspects Stefan of resistance activities and periodically shows up to search the house. One night, he finds one of the anti-Nazi leaflet that had been dropped by RAF planes in Karl's copy of Hitler's book Mein Kampf. Stefan is placed under arrest and taken away. Now, Karl and Lisa decide to become their own Edelweiss Pirates and paint anti-Nazi messages around their village, and to find a way to free Stefan from Gestapo headquarters. And although they are a resistance group of two, Karl is still wracked with guilt since it is because he chose to save the leaflet without telling anyone and feels it is his fault his brother has been arrested by the Gestapo - again. Like Dan Smith's last novel, My Friend the Enemy, My Brother's Secret is a thought-provoking story loaded with action, excitement, and nail-biting tension. Karl's life felt so simple and straightforward before news of his father's death arrived. But his hesitant feeling about having to fight Johann Weber at the beginning of the novel, clearly indicates that there exists a slight crack in his loyalty to Hitler and everything the Führer stands for. 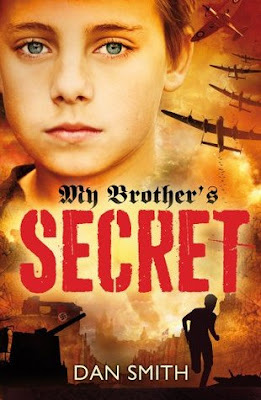 There aren't too many books about young people in Nazi Germany who were involved in the Hitler Youth groups, so it was interesting to read this coming of age novel and to witness Karl's complete turnabout as he begins to see and experience the Nazis for the cruel people that they could be if you opposed them. It is also interesting to see how easily the Nazi could sow an atmosphere of fear, mistrust and suspicion to keep people in line. Dan Smith always includes nice historical information in his novels which give them such a sense of reality. There weren't many youth resistance groups in Nazi Germany, besides the White Rose (Weiße Rose) in 1942 Munich, and the Edelweiss Pirates (Edelweißpiraten), who, as Smith demonstrates through Stefan, were not pro-Allies even though they were anti-Nazi. Like Stefan, many young people who were part of the Edelweiss Pirates quit school in order to avoid having to join the Hitler Youth, which was mandatory. My Brother's Secret is a well-written, well-researched, eye-opening, gripping novel with a lot of appeal. Karl is a protagonist that goes from unsympathetic to sympathetic as the action unfolds and as he learns valuable lessons about courage, loyalty, friendship and brotherly love.